This painting was a birthday commission. I had a very busy, windy day yesterday at the charity lunch. Fortunately, the organiser allowed me to set up my easel in the warm kitchen out of the wind otherwise things could have got a bit messy. Photos to follow. In the meantime, just off to Cornbury festival to watch Elvis Costello among others. It’s mercifully not too ”young” so my comfy shoes will hopefully go un-noticed amidst the hunter wellies and maxi dresses. The sight of a middle-aged woman in a foldup chair doing Sudoku in the breaks shouldn’t cause a stir. Flasks and blankets at the ready – I’m under strict instructions not to so much as tap a foot…………pity. I haven’t posted for a couple of days as I had been spending time with my sister in Somerset. 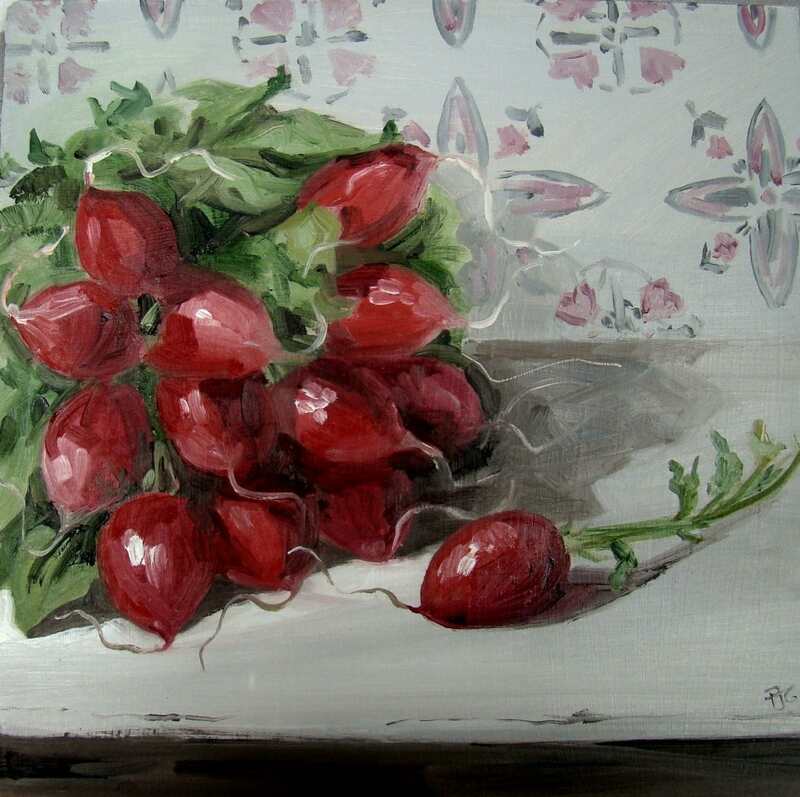 Here are some radishes I did last week. Tomorrow I will be at a Charity Lunch and Summer Fayre at Bay Tree Cottage, Farthingstone doing demonstrations and selling paintings and cards. If you’re in the area, please come along………. it’s all in a good cause or two Macmillan and Cynthia Spencer Hospice. Buffet, champagne and Pimms, raffles, music, stalls………… what more could you want. Sunshine I hear you say…….we’ve got that covered too. Another stack of coronation mugs which were a commission after the London show. It seems that the jubilee has struck a chord with a lot of people. Just wish the weather would oblige. I found these radishes, complete with leaves, at the market as I was wandering through on my way to the framer’s. There’s something about vegetables still with their leaves on that I love. Another rotten dull day and things being cancelled left, right and centre. Very glad I’m too old and uncool to go to the Isle of Wight festival these days, lots of poor bods stuck in their cars. I hope it cheers up for them. Spent a rainy afternoon yesterday watching Aung San Suu Kyi’s speech – what a great day. Yet another cornishware stack but……..I can’t help it, it’s a fix. I didn’t make it up to London to wave flags but am about to switch on the TV to hear her address to Parliament………..should be interesting. There still seems to be plenty of asparagus around – I guess it’s been a good year for it weather wise? I have spent hours on the internet today trying to find out where Aung San Suu Kyi will be tomorrow since I missed waving a flag at her today in Oxford. She is my all time number one hero………the world needs more people with her guts. This is a commission I did in response to a request after the previous pink peonies painting. We have just had supper in the garden for the first time this year (apart from that glorious week in May)………………….squid stir-fry and now an early night in preparation for sports day tomorrow – watching that is. Thankfully we’ve outgrown mothers’ races. These burnt orange tulips were a gift a few weeks back – the most amazing colour, I had to paint them. The trouble with painting gifts is that they sit in my studio where only I get to enjoy them…………..hey ho. Another British icon……………….best enjoyed over baked peaches with vanilla. I’m working my way through the larder.